The Red Car Trolley is one of the newer attractions at Disney California Adventure. You can take the car from Buena Vista Street to the Hollywood Tower of Terror and back, but the best part is that the trolley sets the stage for a group of singers and dancers to perform at Buena Vista Street. While many people are predicting the demise of the newspaper, in 1923, newspapers were a part of life. DCA brings the romance attached to newspapers back with an innovative show. The newsies, the boys and girls selling The Buena Vista Bugle for 2 cents, sing and dance to tunes that are relevant to the era. Mickey Mouse blinks and moves his mouth when he talks. This relatively new technology may go unnoticed even by park veterans who can’t remember a time when he didn’t do that. The best part about the show is that it is actually supported by at least one news rack located near the bathrooms at the entrance to DCA, and it’s free. The paper appears to be put out quarterly, is four pages long and contains news-like elements written in a pseudo-1920s style. The headlines for the Winter 2013 edition included “Winter Dreams Arrive!” “Holiday Spirit Shines on Buena Vista Street,” and “Three Caballeros Flock to “Disney Viva Navidad!”” They like the exclamation mark in this paper. 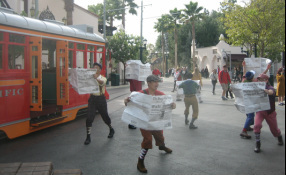 The articles are short, and the paper includes advertisements for various happenings in the park.